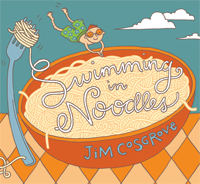 For two decades award-winning kid-rocker Jim “Mr. 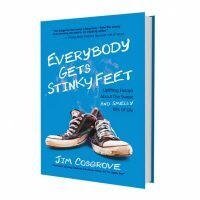 Stinky Feet” Cosgrove has entertained families throughout North America and Europe. Here are 19 of his greatest hits, including several “anniversary editions” that have been re-imagined and re-recorded. 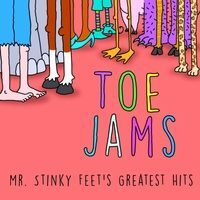 * Out of Stock Check out Mr. Stinky Feet’s Greatest Hits CD, “Toe Jams” for all the classic songs like Bop Bop Dinosaur! This adorable, six inch, plush Boxer-saurus was inspired by the very first song Jim ever wrote for children, Bop Bop Dinosaur. 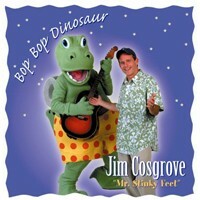 He makes a great companion to the Bop Bop Dinosaur CD. (Doll does not dance on his own). 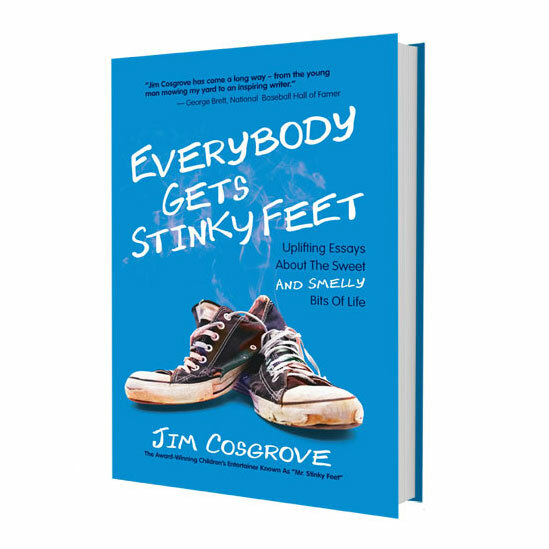 If you’ve ever seen Mr. Stinky Feet live, then you’ll appreciate the inspiration for “Pick Me! 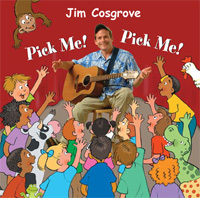 Pick Me!” And there’s a nice range of musical styles – the Elvis-gone-Cajun “Monster Trucks,” a surf-style rockin’ “Little Red Wagon,” the swinging-blues of “Put Down the Binky,” a sweet-sounding “If I were a Dog,” and the full-blown country title song. (A total of 14 tracks.) Pick this one and you’ll all be boppin’ and singing along. It’s easy to hear why thousands of families make this album a part of their annual holiday celebrations. 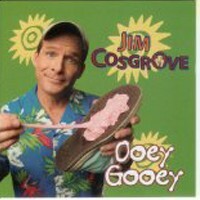 This wholesome mix of upbeat, clever originals and beloved holiday classics blends Cosgrove’s soothing voice and playfulness with the beauty and strength of the Kansas City Children’s Chorus. The perfect soundtrack for the next family road trip! As you’re driving through towns that sound good enough to eat, you can count cows and much on peanut butter sandwiches while trying to get truck drivers to blow their horns. This has become a road trip necessity for thousands of families! 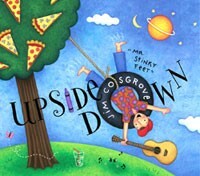 From bugs having a party in the basement to scribbling with friends to hanging out in a Pizza Tree in the backyard – you’ll flip upside down for this music. It even features a grooving parody of Aretha Franklin’s Think! Dive into 14 energetic tunes from the Midwest’s favorite kid rocker. Get ready to groove with the whole family, because mom and dad are going to enjoy this just as much as the kids. Produced by Grammy-nominated producer. Tor Hyams. NAPPA Gold Award and Parents’ Choice “Recommended” Award Winner! 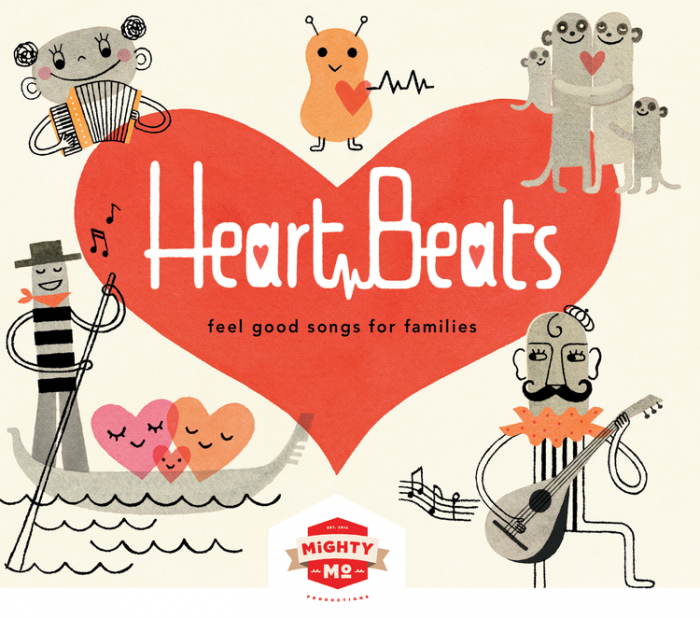 A cool collection of the sweetest love songs for families. Voted 2016 CD OF THE YEAR by Creative Child Magazine. Produced Mighty Mo Productions. Mighty Mo Productions was born out of love and is rooted in the heart – the heart of music, the heart of family, and the heart of America. From its origins on the banks of the mighty Missouri River, this Kansas City-based independent record label was founded by musicians with a mission to keep it real. 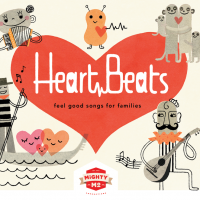 The CDs feature genuine, passionate, independent, “kindie” artists who create quality music for families to enjoy together.